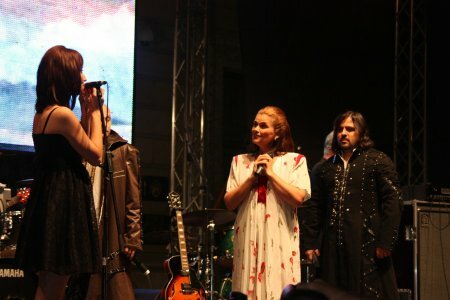 One of the concerts I saw at Bucharest Days was “Balade din Carpati” (“Carpathian Ballads”) by K1 and Felicia Filip: not sure what was their target with such an interesting combination of modern, classic and traditional music, maybe they wanted to cash in on the Nightwish success, maybe they were awed by Therion or something else… the point is: it was interesting but to use a well known expression: “close, but no cigar”. First of all, I should acknowledge the sound system in the street was total crap (it was crap also a night before when Mircea Baniciu performed together with Vladi Cnejevici, and that was folk music, where everyone knew the songs), so the experience was far from optimal. First of all, the K1 band cannot hide its roots in a boy bad: they sing, move and dace like a boy band and this is ….bleah. They were the lowest point of the show, their dance stuff destroy all the symphonic metal stuff. Then the “story teller”, Vlad Radescu, he can’t hold a candle to Christopher Lee in Symphony of Enchanted Lands II by Rhapsody of Fire. But, honestly, who can hold a candle to Saruman? He do not even tried: no cavernous voice, no magic, no nothing. I do not care about the joyful voice of a bald guy. Felicia Filip did her best, she is a great soprano with an amazing voice, no complaint about her. What I think was the highlight of the show was Cornelia Tihon, she is really great with the Pan flute (and other woodwind instruments, like regular flute or tulnic, she also has some extraordinary legs and is not afraid to show them on stage. I will hold a final conclusion until I hear a show in better acoustic conditions (YouTube is full of recorded clips from various concerts, do a search and apply your own judgement), but my initial bias is not very positive, I was disappointed.